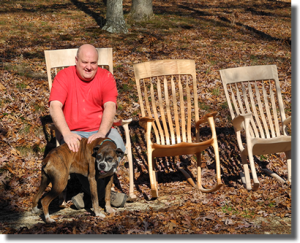 If you like rocking chairs, please make plans to attend our sculpted rocker class. You will want to schedule this soon to make sure you have the time and decide on materials. I am not taking credit for designing this chair! Most woodworkers have heard of Sam Maloof, and admired his organic designs, especially his famous rocking chair. Maloof actually invented a new joint where the seat meets the legs. If you are unfamiliar with this chair just Google “Sam Maloof rocking chair image”. This sculpted rocking chair represents an exercise in modern design and is extremely comfortable. 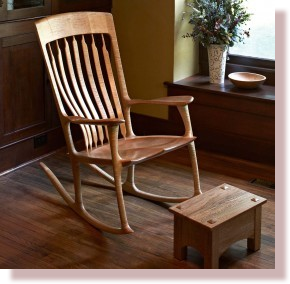 There are an incredible amount of woodworkers with slight variations on this rocker. I took a class from Andy Chidwick several years ago. I made some design changes in the arms of my chair. I always tell everyone that I adapted this design from Andy Chidwick, who adapted it from Hal Taylor (known for his original design of StoryTime Rocking Chair) , who adapted it from Sam Maloof, who got some of his design from Wharton Esherick and on and on. You might Google these names to see what you think. Everyone who sits in my chair wants one, but most can’t afford the $6000 plus price. Believe me, I wish they could. Many of you on my email list may have sat in my chair while attending a Woodworking in America Conference. So many coming into my booth expressed an interest in making this rocker in a class. So I’ve listened and I believe dealt with the main problem you face. That problem is completing the chair during your class. Now, I know there are other woodworking instructors that offer the Maloof rocker or a version of it in a six-day class. They’re good instructors, and they teach all skills needed to complete the chair at home. Many students I’ve spoken with don’t like that approach because working on it at home can drag into a six months or more project. With your comments and questions in mind, I decided to develop this class. My approach is different; in that, I teach it in two five-day classes. The first class, Part One, we will have all four legs, seat carved, crest rail shaped… half finished. At the end of the second class, Part Two, your chair will be complete, all sculpted – together and rocking. Breaking the building of this rocker apart in these two classes Makes Sure that you will finish your chair. Your homework will be the final sanding, polishing, and finish. As an added bonus for the class, I wanted to allow the student to choose the wood of their choice. You can use cherry, walnut, maple or any other species we can find. For Part One you need to call soon to ensure the wood will arrive on time. At that time, we will discuss the price and alternatives should the wood not be available. Just as in life where one size does not fit all, one size rocking chair does not fit all body types and sizes. We offer the chair in three sizes, one of them will fit your body. Currently, I have a small and medium chair you can sit in before deciding which size you want to build. The skills involved in making this chair are new to most intermediate woodworkers and would be a pleasant challenge. I am confident that most advanced beginners would have no problem building this chair during my class because the class size is only four student limit. As a side note, I found that most people who consider themselves beginners can do much more complex projects than they imagine they can, with a good instructor and in the right environment. The cost of the class is $825 for Part One and $825 Part Two plus materials and taxes. For more class details. And check out Accommodations offered at the Guest House. So, in making your decision remember this chair will be your masterpiece and make you very proud. 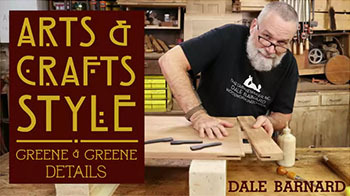 The skills you learn will be used to make the chair again, and in new designs of your own.